12 Days of Christmas Giveaways at The Hive Starting Today! Hey, everyone, if you have not yet already checked out the social networking site for artists and crafters known as "The Hive", now is a great time to do so. Beginning today, The Hive is having it's 12 Days of Christmas giveaway. Several vendors have donated cool prizes for the giveaway, including gift certificates, handmade ornaments, jewelry and more! 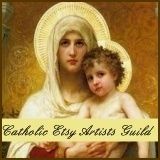 I've donated 2 gift certificates from my Two Crafty Mules EBay store, an Our Lady of Mount Carmel pendant and a retro glass bauble Christmas bracelet for the big event. Be sure to stop by and enter each day to win that day's prize(s). Good luck and have a very Happy 12 Days of Christmas!